You would be hard pressed to dissuade us from the notion that at its core the most effective and consistent market analysis is illuminated by a rigorous - yet nuanced, comparative framework. For fundamental investors, metrics such as comparing a stocks performance to the previous quarter, or to the same quarter in previous years - is a way of getting a situational bearing on an investment. For value investors it's a similar methodology, just the comparisons are contrasted to what is perceived as value - based on analytics such as price-to-earnings, price-to-book, debt-to-equity - etc. Tying it all together and triangulating both schools of thought is a well referenced historical narrative, that puts within context the varying arcs of performance of past investments. What's past is prologue - and the present is always measured and described against it. All of these respective approaches have their own merits and utility, because also at its core is the understanding that although market climates are inevitably unique for each time, the underlying behavior that drives the collective is not. As much as one tries to embrace the idea of a random walk down Wall Street, if it wasn't for the invariant nature of different market psychologies, investors such as Soros, Buffett and Icahn would not consistently outperform the market - cycle after cycle. While they exploit different sections along the behavioral continuum - they all still work and reference their investment decisions from it. 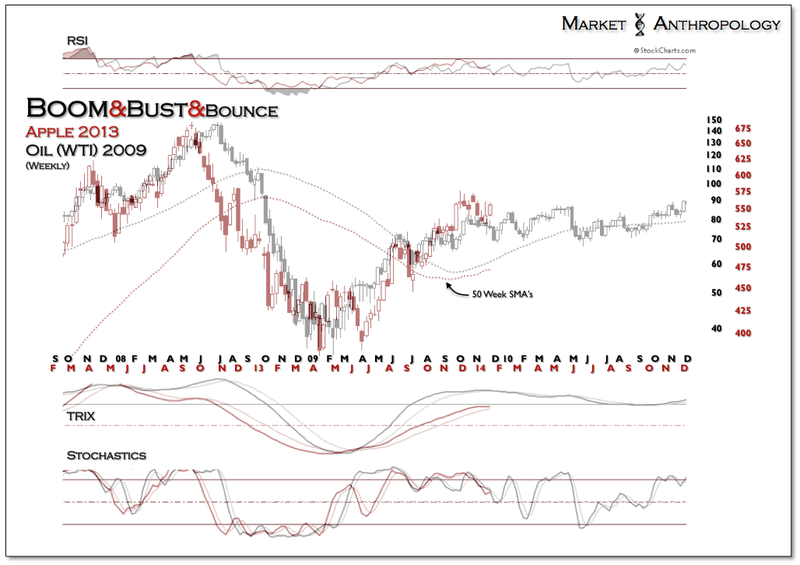 Why did we compare the trend of Apple in December 2012 with the oil market in 2008? In this circumstance, because the quality of the underlying market psychology that drove both of these dominant trends was very similar - which manifested themselves in congruent momentum structures. While we have adjusted with the nuances of the comparison along the way - overall it has been a remarkably profitable guide for remaining on the right side of a powerful performance trend over the past year. What's important to understand with these comparative guides is that the current market will eventually break pattern and take on a different disposition. In our experience, the further a market gets from the heightened zone of volatility, the greater chances that the market audibles to new motivational catalysts. Like a rock lobbed into a pond, the geometry and momentum will replicate over-and-over again with great congruency at the point of entry - and will dissipate and become susceptible to exogenous conditions as you move further away from the epicenter of disturbance. Ironically, while Icahn continues to throw more pixie dust at the stock through Twitter, his exogenous influence appears to be waning as the market continues to follow the consolidating profile of the comparative pattern. Having said that - and to his great credit, he did pick the right asset to influence this past summer.